AirAsia X is poised to build on its leading position in Asia’s emerging medium/long-haul low-cost sector after completing a successful initial public offering. The IPO, which raised MYR741 million (USD232 million), will enable the Malaysia-based company to pursue ambitious fleet and network expansion with a focus on exploiting opportunities in the rapidly growing Asia-Pacific market. While the LCC penetration rates within Southeast Asia are now above 50%, the medium-haul market connecting Southeast Asia with other parts of the Asia-Pacific region remains relatively unpenetrated. AirAsia X is now focusing on this market, having dropped long-haul services in early 2012 as part of a drastic network restructuring which has already improved its profitability and outlook. Expansion will come as AirAsia X adds capacity in several markets it already serves from its existing hub in Kuala Lumpur and opens new bases in other Southeast Asian countries, starting with Thailand. AirAsia X is no longer the only widebody low-cost operator targeting Southeast Asia’s under-penetrated medium-haul markets. But the three other Asian carriers competing in this sector are smaller and have little or no growth planned for the next 18 months. AirAsia X meanwhile plans to roughly double in size by the end of 2014, which should give it at least a 60% share of Southeast Asia’s medium/long-haul low-cost sector. AirAsia X share began trading on Bursa Malaysia, formerly known as the Kuala Lumpur Stock Exchange, on 10-Jul-2013. Just over 790 million shares were sold, including 592.6 million new shares, at MYR1.25 per share (USD39 cents), making it the largest IPO in Malaysia so far this year. Shares rose slightly during the first day of trading on 10-Jul-2013 but have since slipped, closing back at the MYR1.25 level on 15-Jul-2013. The float involved a 33% stake of AirAsia X with its largest shareholder, Aero Ventures, accounting for most of the divesture. Aero Ventures, an investment firm controlled by AirAsia Group founder and CEO Tony Fernandes and partners, still has a leading 34.4% stake in AirAsia, down from 52.2% before the IPO. AirAsia Berhad, which owns 100% of the Malaysian short-haul carrier AirAsia along with minority stakes in other AirAsia affiliates, sold down its stake from 18.3% to 12.1%. AirAsia X is technically not part of the AirAsia Group but has access to the AirAsia brand through a licensing agreement. AirAsia X also uses the AirAsia website and offers connections with the Malaysian short-haul carrier, providing a seamless experience for passengers. Following the AirAsia Group model of establishing affiliates in other Asian countries, AirAsia X plans to establish new joint venture medium/long-haul LCCs, starting with Thai AirAsia X, which will work closely with short-haul operator Thai AirAsia. Thai AirAsia X is backed by AirAsia X and Thai AirAsia’s largest shareholder and CEO, Tassapon Bijleveld. The new carrier is in the process of applying for an air operators’ certificate in Thailand and is expected to launch services in late 2013 or early 2014. Thai AirAsia completed its own IPO in 2012. Indonesia AirAsia, which is 49%-owned by AirAsia Berhad, is also now preparing for an IPO which it aims to complete by the end of 2013. AirAsia Berhad also owns 40% of AirAsia Philippines, which launched services in 2012 and now has a stake in Philippine LCC Zest Airways. AirAsia Berhad owns 49% in AirAsia India, which plans to launch domestic services in 4Q2013, but recently sold its 49% stake in AirAsia Japan to controlling shareholder All Nippon Airways (the carrier will drop the AirAsia name on 31-Oct-2013). AirAsia X launched services in 2007, becoming the fourth AirAsia-branded carrier following AirAsia (Malaysia), Thai AirAsia and Indonesia AirAsia. But of these initial four carriers, AirAsia X has been the least profitable. AirAsia X has had only two profitable years, 2010 and 2012. But its financial outlook has significantly improved since the network restructuring it implemented in early 2012, which eliminated unprofitable routes to Europe, New Zealand and India. AirAsia X reported a record operating profit of MYR49 million (USD15 million) in 2012, a significant improvement compared to the MYR60 million (USD19 million) operating loss in 2011 and small MYR7 million (USD2 million) operating profit from 2010. A further significant improvement to the bottom line is likely in 2013 after AirAsia X reported a 72% increase in operating profit for 1Q2013 to MYR58 million (USD18 million). AirAsia X in 1H2012 cut five of 16 destinations: Mumbai (Jan-2012), New Delhi (Mar-2012), Paris Orly (Mar-2012), London Gatwick (Mar-2012) and Christchurch (May-2012). The cuts, which included its three longest routes and India, drove a drop in revenues and RPKs for 2012 and in 1Q2013 (see background information). But costs dropped by an even bigger margin driven by lower fuel consumption as extremely unprofitable services to Paris and London, which were served with now phased out A340s, were axed. In 1Q2013, operating costs dropped by 5% year-over-year to MYR479 million (USD150 million) as fuel consumption declined by 21%. Revenues dropped by only 2% from MYR537 million (USD165 million) in 1Q2012 to MYR525 million (USD165 million) in 1Q2013. The restructuring has resulted in a 13% drop in average stage length from 5,771km in 1Q2012 to 5,039km in 1Q2013. AirAsia X, however, was able to maintain daily aircraft utilisation levels at just over 16hrs as more flights within Asia were added to fill the void. 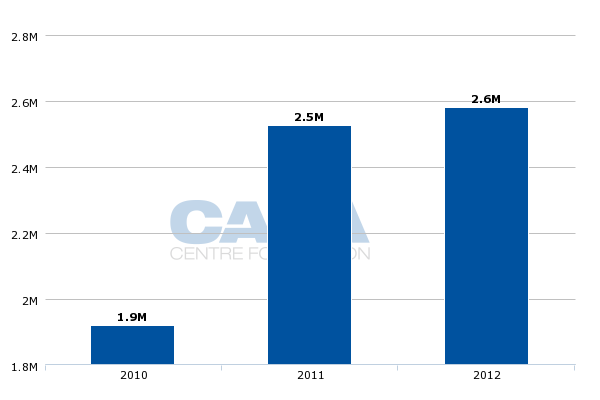 Posting financial improvements in 2H2012 and 1Q2013 were essential to the successful IPO. AirAsia X initially sought an IPO in late 2012 but its initial prospectus did not show a clear path to profitability because at the time financials were only available through 1H2012. AirAsia X’s network now consists again of 15 routes, just one less than it had at the beginning of 2012. Kathmandu was added in 2012 while Jeddah and Shanghai were launched in Feb-2013. Two weekly flights from Kuala Lumpur to Busan in South Korea began on 15-Jul-2013. Further expansion is expected over the next two years with a focus on more flights to the seven countries already served by AirAsia X, particularly Australia, China, Japan and South Korea. This will include adding frequencies on existing routes with the aim of upgrading its biggest markets to double daily and those markets now served with less than seven weekly flights to daily. Of AirAsia X’s 15 routes, six are currently served less than daily – Kuala Lumpur to Busan (PUS), Gold Coast (OOL), Hangzhou (HGH), Kathmandu (KTM), Osaka (KIK) and Jeddah (JED). Five are served daily and another four are served more than daily (see chart below). Only one of these, Taipei, is currently served with two daily flights although this will change in the coming months as at least three more routes are upgraded to double daily. The short to medium term AirAsia X expansion strategy also envisions several new destinations in countries the carrier already serves. This represents a smart low risk strategy as AirAsia X can leverage the brand it has built up in the key markets of Australia, China, South Korea and Japan. These markets all remain relatively un-served by Southeast Asian low-cost carriers. Busan has already become the carrier’s second destination in South Korea after Seoul. AirAsia X is now looking at potential third and fourth destinations in Japan to supplement Tokyo Haneda and Osaka Kansai. Fukuoka, Nagoya and Sapporo are all possibilities. If anything AirAsia Group’s pullout of the Japanese short-haul market could increase the likelihood of new international flights to Japan from Southeast Asia as AirAsia is keen to continue expanding its presence in Japan and will now need to serve secondary cities directly instead of via connections with AirAsia Japan. In China, AirAsia X continues to look at several destinations in central, western and northern China while AirAsia Malaysia sticks to destinations in southern China which are within four hours of Kuala Lumpur. AirAsia X also plans to focus on existing destinations as it opens new bases. Australia, South Korea and Japan are all likely initial destinations for Thai AirAsia X. A possible third base in Indonesia, likely Bali, could also be linked with these same set of destinations as AirAsia X looks to connect the dots in its network, following a similar strategy used by its short-haul sister carriers. AirAsia X has already started to accelerate expansion, ending a relatively long period of limited to no growth – which is highly unusual for any AirAsia affiliate. As of the end of 1Q2013 AirAsia X had a fleet of only nine aircraft – all A330-300s. AirAsia X operated 11 aircraft from 2010 to early 2012, when it phased out A340s from scheduled services. Passenger traffic in 2012 was up by only 2% to 2.6 million passengers while RPKs were down 4%. 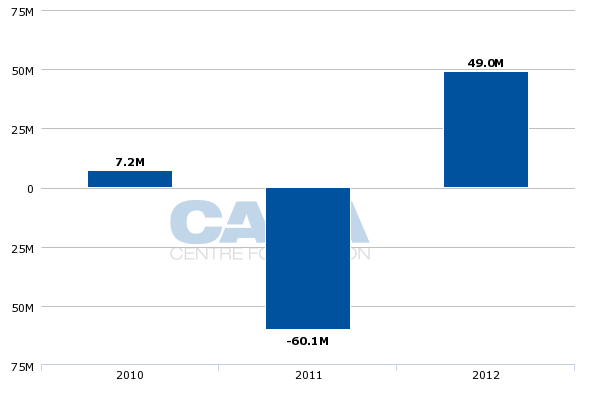 ASKs in 2012 were down 8% as the carrier’s load factor improved by 3.7ppt to 83.8%. But seat capacity and ASKs have started to come back up since the beginning of Apr-2013 as AirAsia has placed into service additional A330s. 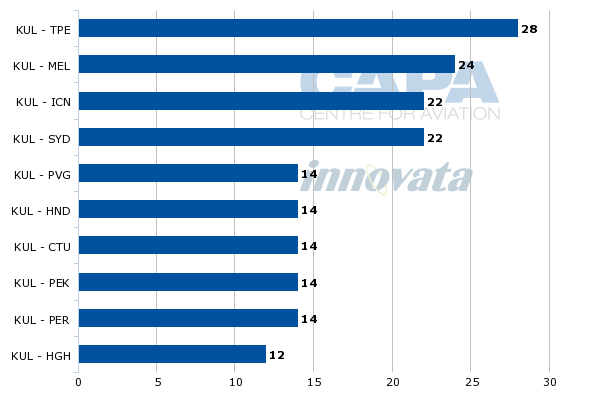 ASKs are projected to increase by 11% over the next six months compared to current levels, according to CAPA and Innovata data. Weekly seats will also climb by about 11% from about 81,400 currently to about 90,500 by the end of Nov-2013. Almost all of the additional seats scheduled to come on line over the next four months are being added to Australia. AirAsia X plans to increase capacity in the Malaysia-Australia market by over 40%, from about 26,400 weekly seats currently to about 37,000 in Dec-2013. AirAsia X typically adds capacity to Australia for the peak season but its Dec-2013 schedule also represents a 40% increase compared to Dec-2012 capacity levels. For the first time, AirAsia X will have more seats to Australia than rival Malaysia Airlines (MAS). Based on current Dec-2013 schedules, AirAsia X will account for 49% of total non-stop capacity in the Malaysia-Australia market compared to 44% for MAS and 7% for Emirates, which serves the Kuala Lumpur-Melbourne route with Qantas as a codeshare partner. The increase in capacity to Australia, which is being implemented in phases over the next three and a half months, is driven completely by additional capacity on existing routes. AirAsia X is doubling service to Perth from seven to 14 weekly frequencies; increasing Sydney from 11 to 14 weekly frequencies; upping Melbourne from 12 to 14 frequencies; and expanding Gold Coast from five to seven frequencies. As a result, total frequencies to Australia are increasing by 40% from 35 to 49. Australia will account for 41% of AirAsia X’s seat capacity in Dec-2013, compared to about 32% currently. The expansion in the Australia operation, which requires the equivalent of two aircraft, is made possible by the delivery of additional A330s. AirAsia X plans to have a fleet of 16 A330s by the end of 2013. It currently has a fleet of 13 aircraft, including four which have been delivered since Apr-2013, according to the CAPA Fleet Database. The recent deliveries have supported frequency increases to several markets in North Asia as well as the new routes to Busan, Shanghai and Jeddah. While capacity to Australia is currently at the same levels as six months ago, AirAsia X has increased capacity in the North Asia market by about 50% from about 33,500 seats in Jan-2013 to over 50,000 seats currently. While AirAsia X has not yet unveiled any plans for capacity increases to North Asia in 2H2013 the carrier is expected to announce within the next few weeks a new destination in Japan. AirAsia X has sufficient additional capacity coming in to pursue more growth in North Asia once again as well as increase capacity to Australia by 40% as already planned. AirAsia X also has been looking at potentially resuming services to India and taking over the Kuala Lumpur-Colombo route, which was operated by AirAsia with A320s until earlier this year. But for now the focus is on expanding in Australia and North Asia with Kathmandu in Nepal its only South Asian destination. Capacity to Kathmandu increased in Apr-2013 with the addition of a fourth weekly frequency, in line with the AirAsia X strategy to add capacity in virtually all existing markets. For now AirAsia X plans to take another 10 A330s in 2015 through 2017, followed by the first of at least 10 A350s in 2018. But expansion in the 2015 to 2017 period could be accelerated by leasing additional aircraft – an option AirAsia has used to accelerate growth this year – or placing more orders. The IPO is helping fund the accelerated fleet growth as AirAsia X grows from only nine aircraft at the start of 2013 to 23 aircraft at the end of 2014. The growth seems rather sudden as it comes after slow expansion in its first five years. But as a pioneer in the medium/long-haul low-cost sector it took time for AirAsia X to tweak its model and network. After the restructuring of early 2012, the carrier now has a foundation to pursue more rapid growth. AirAsia X also has a window to distance the gap with its competitors. Jetstar has reduced its widebody fleet over the last year by one aircraft to 10 A330-200s and is not expected to expand its fleet until 2015, when the last batch of 787s is delivered. The Australia-based LCC group has 14 787-8s on order for delivery starting in Sep-2013 but the first 10 aircraft are expected to replace its A330-200s, which need to urgently be returned to parent Qantas. Jetstar has cut back its Singapore long-haul base in recent months as it has reduced frequencies on all four routes – Auckland, Beijing, Melbourne and Osaka. Its Singapore long-haul operation, which at one point was expected to grow to four aircraft in 2012, currently only consists of 14 weekly return flights. Jetstar’s long-haul operation also currently includes 16 weekly return flights to three Southeast Asian destinations from Australia. Jetstar operates A330s to Bangkok from Melbourne, to Phuket from Sydney and to Bali from both Melbourne and Sydney. Jetstar began long-haul operations in Nov-2006, one year before the launch of AirAsia X.
Singapore Airlines' long-haul low-cost subsidiary Scoot, which launched services in mid-2012, is also taking a two-year moratorium in expanding. It currently offers about 39,000 weekly seats on eight routes (including one short-haul route to Bangkok) with a fleet of five 777-200s. But Scoot has decided against taking additional 777s and instead will wait for 787s before resuming growth. Scoot has big growth ambitions as it has 20 787-8/9s on order. But like Jetstar it will use its first batch of 787s to replace its existing aircraft. As a result, Scoot will not grow until it takes its sixth 787 in mid-2015. With neither Jetstar nor Scoot planning to grow the size of their fleets until 2015, AirAsia X will be able to further increase its share of the Southeast Asian medium/long-haul low-cost market. AirAsia X will already see its share of this market grow from about 53% currently to about 55% by the end of 2013. This share could easily surpass 60% by the end of 2014 as seven A330s are added while capacity at Scoot and Jetstar remain flat. The only other Asian long-haul low-cost operation also plans relatively modest growth over the next two years. Cebu Pacific placed into service its first A330-300 in Jul-2013 and is currently using the aircraft on daily flights to Singapore and Seoul. Daily flights to Dubai will be added in Oct-2013, at which point Cebu Pacific will have two A330s. The Philippine LCC intends eventually to acquire a fleet of eight A330-300s but this could take a few years to achieve as it has not yet secured leases on additional aircraft. As Cebu Pacific slowly builds up its widebody operation, AirAsia X will be expanding rapidly, leveraging its first mover advantage and its strong brand. AirAsia X is also considering Manila as a future potential base. European LCC Norwegian also now operates long-haul services to Southeast Asia, having launched services to Bangkok from Oslo and Stockholm in Jun-2013. But Norwegian’s presence in Southeast Asia will remain relatively small as the carrier’s new long-haul operation also includes services to North America. Norwegian also does not overlap at all with AirAsia X or any of Asia’s long-haul LCCs as it the only LCC in the Asia-Europe market and the only LCC currently operating routes of over 11 hours. If Norwegian is successful at developing long-haul markets with 787s, AirAsia X could follow by using its future fleet of A350s to re-enter the European market. While ultra long-range flights are hard to sustain with the current generation of aircraft, new-generation aircraft may sufficiently change the operating economics to open up longer routes to the emerging long-haul LCC sector. There are plenty of opportunities for further low-cost growth in AirAsia X’s core markets. 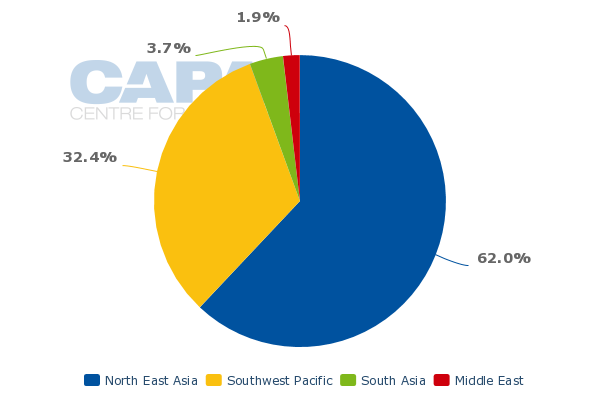 LCCs still only account for 25% of seat capacity between Southeast Asia and Australia, according to CAPA and Innovata data. LCCs also currently only account for 20% of non-stop seat capacity between Southeast Asia and South Korea and just 4% of non-stop seat capacity between Southeast Asia and Japan. The long-haul low-cost model is still relatively unproven across a range of routes. None of the long-haul low-cost operations have been profitable yet on a cumulative basis. But AirAsia X has shown the model can be successful when sticking to routes of nine hours or less and focusing on the Asia-Pacific region, where demand continues to grow rapidly. 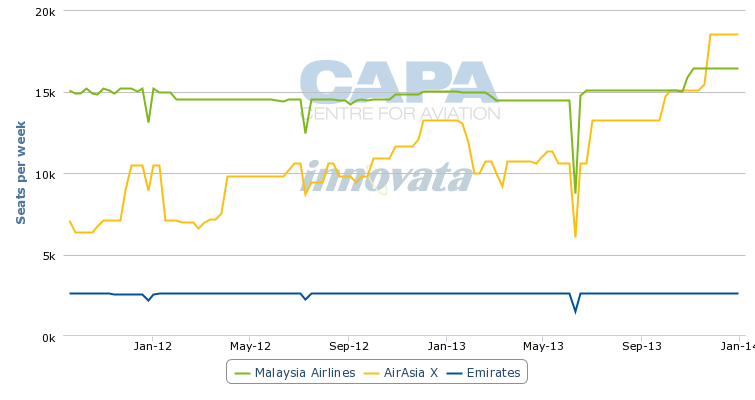 Other carriers have followed AirAsia X’s trail. The slowdown in growth of its main competitors offers a window for AirAsia X to cement its leading position and silence the remaining sceptics by proving the long-haul low-cost model can be highly profitable and sustainable. AirAsia X’s network restructuring of early 2012 has resulted in an increase in cost per ASK but this has been more than offset by an increase in revenue per ASK. Average fares dropped by only 4% in 2012, an encouraging sign given the 13% drop in stage length and the fact that a MYR20 (USD6) increase in ancillaries to MYR142 (USD45) offset the MYR21 (USD7) reduction in average fares to MYR555 (USD174). For 1Q2013, average fares were up 3% or about MYR20 (USD6) to MYR624 (USD196) while ancillaries were also up MYR17 (USD5) per passenger to MYR150 (USD47). Stage length was down by 13% compared to 1Q2012 levels. On an operating margin basis, AirAsia X has still not approached the levels of its Malaysian short-haul sister carrier AirAsia, which had a 23% margin in 2012 and 20% margin in 1Q2013. AirAsia X’s operating profit margin was less than 3% in 2012, compared to a negative figure in 2011 and less than 1% in 2010. In 1Q2012 AirAsia X’s operating profit margin was 11% compared to 6% in 1Q2012. This provides some promise that double digit profit margins are possible with the long-haul low-cost model, particularly as AirAsia X gains economy of scale.